Let's go winter camping! Pardon me? 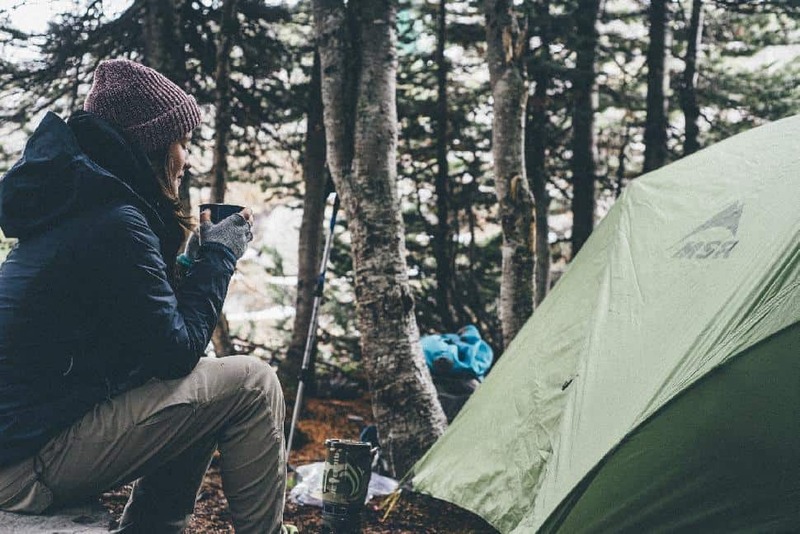 No, your friends have not succumbed to cabin fever, winter camping really is a “thing” and you don't even need to be Bear Grylls to do it. Sure, you won’t be spending the evenings lounging around the campfire; the joys of winter camping are more subtle. But how about a night spent under a full winter moon? Sounds pretty majestic doesn't it? With some planning and the proper equipment (and maybe some whiskey in your flask) you too can get into this unique hobby. Sounds cold. Why are people doing this? In short? Serenity and solitude. The utter silence of a winter evening with no birds calling, no buzzing insects and only the occasional plop of snow dropping from a branch connects campers to the cosmos. Need more convincing? On a clear evening the inky black sky is illuminated with more stars than seems possible. Framed by silhouettes of surrounding trees, moonlight transforms the world into a place of magic. Look for passing satellites and planes while you try to identify star constellations. Don't be surprised if you don't recognize a few. After all, they differ from those seen in the summer sky. The best reward of all is catching the Northern Lights, sure to be a memory never forgotten. Campsites in the summer are normally limited to designated areas and pads. However, once the ground is frozen, there’s nearly no limit to primitive tenting. Okay, don’t pitch on a lake, but effectively swamps, marshlands and even heavily wooded areas are up for grabs. Choose a spot that’s sheltered from the wind with plenty of burnable wood nearby. Snow campers are a hardier bunch. There's less of them (compared to summer) and by nature, winter camping is less family-friendly. If you're venturing within a state or federal park or on popular trails, of course you may very well meet other rec users. In the backcountry snowshoeing and Nordic skiing are popular but you can likely expect most day users to head back to town come nightfall. Lucky for you; the surrounding stillness creates an excellent environment for introspection and quiet contemplation of the universe and your place in it. A summer campfire is fun, but a winter campfire is a necessity. While gathering firewood, collect a selection from different tree types to appreciate the different qualities of the wood. Dried limbs from evergreens such as cedar and pine catch easily and burn hot and fast. Use these to get the campfire started and switch to a longer burning wood once the flames are well-established. Deciduous trees drop branches that burn slowly, maintaining the fire for longer. The harder woods (maple, oak, ironwood) produce a consistent flame that doesn’t need to be fed as often. If identifying wood isn’t your thing, follow the general rule: the harder it is to cut, the longer it will burn. Sleeping outside when the thermometer dips well below freezing is a feat few boast of. Add highlights like the howl of a wolf in the far off distance and a few anecdotes about spotting Bigfoot and you may find your beers for the evening are covered by enraptured listeners. What do I need for winter camping? Surprisingly you don’t need a winter tent, the three-season variety works just fine for most conditions - with a few additions. Include a tarp to create a movable windblock and bring a liner for your sleeping bag. 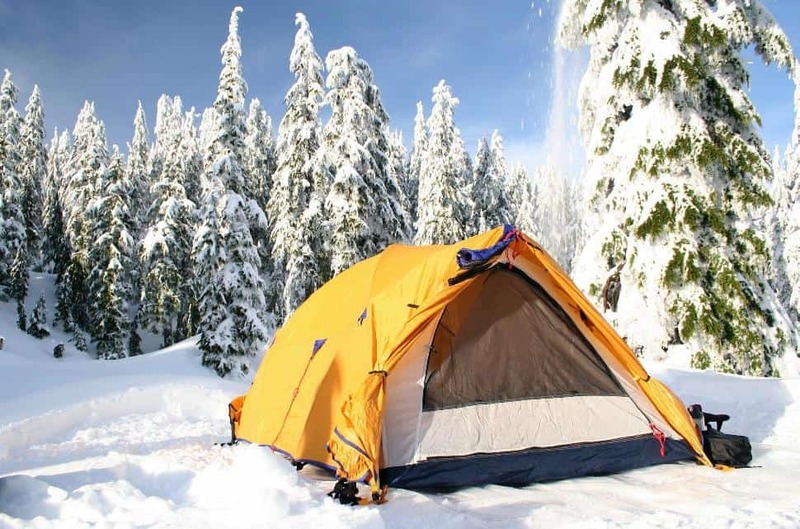 A ground cloth or second tarp provides protection for the bottom of your tent and from melting snow. That being said, if your destination is subject to winter storms or you intend to attempt an expedition, you're best off investing in a technical, made-for-winter tent. You can increase the warmth of your regular sleeping bag by adding a warm liner. A little searching turns up directions for making your own felt liners, but a quality liner from a sporting goods store is not expensive and adds more warmth than the DIY versions. Pack at least one and preferably two sleeping pads for insulation. Closed-cell foam pads with an R-value closer to 8 will provide the best insulation from the cold ground. Layers, layers, layers. Skip the naturals and go with engineered fabrics that wick away moisture and dry quickly. Wool is a good, natural insulator and skip cottons. The base layer near your skin should be light and comfortable, followed by a midweight layer. For colder weather, switch to midweight near your skin and a heavier layer over that. The middle layer of clothing is typically fleece or microfleece both upper and lower. A down-filled jacket or heavier fleece can be added for icier temperatures. The outer layer needs to be waterproof and breathable. High-tech options are made of Gore-Tex or other proprietary fabrics and can be pricey. Invest in good gear or borrow some if the trip is going to be long. Lower cost alternatives include polyurethane-coated fabrics that provide good weatherproofing but tend to be less breathable. Choose jackets with vents that allow moisture to escape. Boots should be appropriate for winter hiking: insulated and waterproof. Don’t skimp on footwear and don’t assume extra socks will keep your feet warm enough. Too many socks can be harmful, cutting off circulation to the feet, resulting in frozen toes. Hats, gloves and socks are all useful for keeping warm. Bring extra just in case one pair gets wet. Goggles and gaiters help add another layer of protection against the wind and sun. Lights, batteries, GPS, phone or radio, maps, first aid kit are all essentials demanded by summer camping. Bring enough high-calorie food for the trip and throw in a few coffee filters to filter melted snow. The pre-planning aspect of a winter camping trip is much more important than for a summer outing. Talk to people who have camped in that area to get tips. The internet and camping supply stores are a great resource. Check the weather well ahead of time and shortly before you leave. Find out if the roads you expect to use are open. Where will you leave your vehicle and can you drive directly to the trailhead? Do you need a 4x4 of winter tires to reach it? Don't forget to check what condition the trails are in. Be avalanche aware and don’t enter any area under an avalanche warning. The weather service does not have all the answers; you need to have the skills and self-sufficiency to deal with all weather factors. Plan one-pot meals for quick dinners and simple clean-up. Use an insulated pad to sit comfortably while eating and dig yourself a comfortable “bench” and “table” out of the snow while dinner is cooking. Add lemonade or Gatorade to the water bottle to keep it from freezing. Keeping the bottle in a wool sock or using an insulated cover also helps keep the water from freezing. When nature calls...using a pee-bottle (yep) at night is so much better than going out into the dark cold to relieve yourself. Mark your bottle with rough tape, a bobbled cover or anything that will indicate to your sleep-fogged mind that it’s NOT your water bottle. 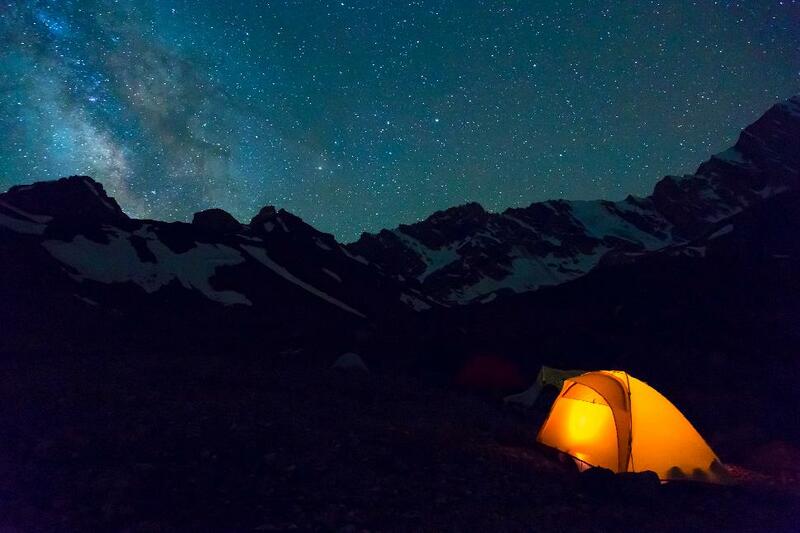 Finding the perfect place to pitch your tent. Snow seems like a nice, soft place to sleep, but unpacked snow will melt around your body. The best campsite requires a bit of planning that includes stamping a flat area where the tent will be pitched. Snow doesn’t hold stakes well, either. Use skewers or snow stakes, and consider adding cord to your stake-out points that can be further anchored with rocks or gallon-size bags of frozen water. Expect a slower pace. The days are shorter and moving in snow takes longer. 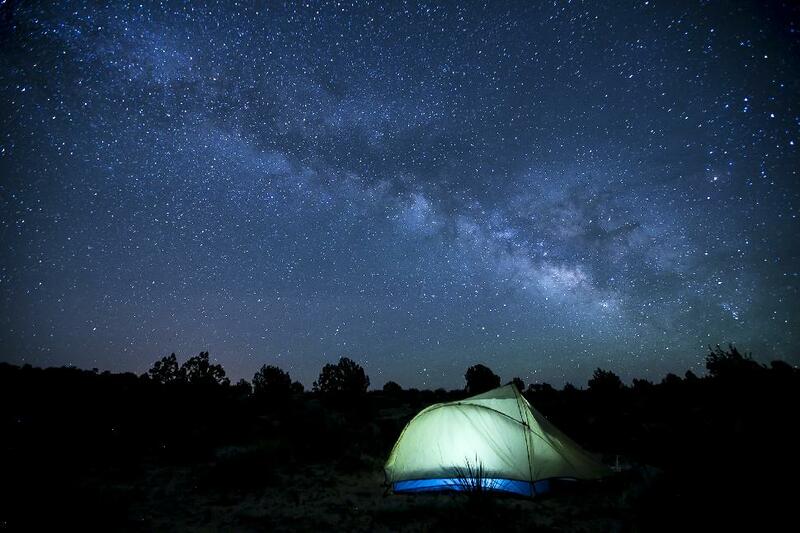 Campsites need to be closer together than a summer hiking trip would need. Your first adventure could even be a long stay at a campsite a short hike from the car. Don’t worry, it will feel remote even if the road is only a few kilometres away. You might need to dig your car out. If the forecast calls for snow in the parking lot plan to bring a collapsible shovel. Put boots in your sleeping bag if possible, or open them up completely so they don’t freeze in a closed position. Putting warm feet into frozen boots is a singularly unpleasant experience and can be mitigated somewhat by dropping an activated hand warmer into each boot for a few minutes before putting them on. Another option is to wrap your boots up with a couple bottles of warm water before you go to sleep. Hopefully the water will still be warm enough in the morning and have kept your boots at a comfortable temperature. Breathing into your sleeping bag at night might seem like a good idea but the added moisture from your breath will make your bag damp and decrease the insulating properties. Keep your mouth and nose outside the bag and wrap a scarf around your face if it’s too cold. Open the tent vents at night for the same reason. Add or remove layers as you go to maintain a comfortable body temperature. Being hot and sweaty can lead to hypothermia as the sweat dries. Letting yourself get cold makes it difficult to warm up again. Hot soup or tea in a thermos can help get body temperatures up quickly if necessary. Be sure to drink enough fluids. Dehydration is a serious issue in the cold. Do you dare go winter camping? 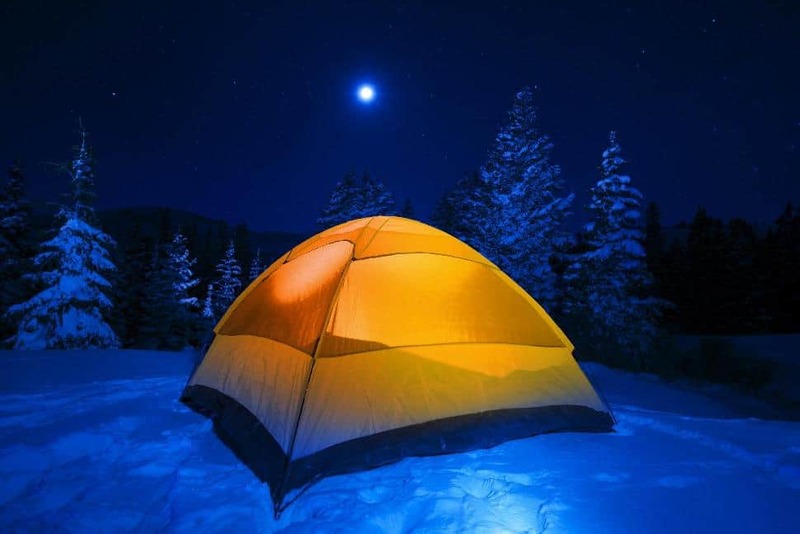 Is winter camping one of your hobbies?